Initially minted in 1921 to mark the anniversary of Mexico’s Independence from Spain, 50 pesos coins are limited quantity bullion 20% larger than their standard one ounce bullion counterparts containing 37.5 grams of pure gold . These beautiful coins carry an image of the Victory Lady on the obverse and eagle with a serpent on its reverse side. Centenarios, as these are often referred to, are not as popular among investors or liquid compared to other bullion coins on the market but carry much lower premiums making them a nearly ideal investment choice. One of the best reasons to invest in 50 pesos gold coin options is the lower price that you will pay. When compared to the price of a gold Eagle coin, Mexican gold pesos usually cost a lot less for the investor. This allows you to get quality gold at a lower cost, so you can buy more of these coins. The 50 pesos gold coin has a heavier weight than the modern one ounce coins available to investors. This coin contains one point two ounces of gold bullion, instead of only containing one ounce. These pesos are larger and heavier than American or other gold coins, and this is one of the reasons that they are very popular with most investors. 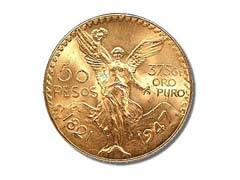 The minting time period for the 50 pesos gold coin was limited to the frame between 1921 and 1947. These are considered older pesos, because they have not been produced in more than half a century, and they make excellent investments in most situations. Because the supply of these coins is limited they have great potential as an investment. Supply and demand helps to set the market price for any commodity, and the 50 pesos gold coin is no different. Because the supply is limited and the investor demand is high, these coins will probably continue to increase in value over the years. Mexican Libertads are also popular, as a silver alternative, and these coins also experience high demand from investors in the precious metals market. One of the advantages of the 50 pesos gold coin with investors is the degree of liquidity that these coins enjoy. This is not true with all gold Mexican coins, especially those which are older or unusual, because it may take time to find a buyer in these situations. With the 50 peso coin you can instantly find a buyer, so there is no delay if you choose to sell your coin investment.